zarinahtakesapaycut: Is it worth the risk? Will you attend a Corporate Governance seminar arranged by Chin Kwai Fatt and Johan Raslan of PwC? Is it worth the risk? Will you attend a Corporate Governance seminar arranged by Chin Kwai Fatt and Johan Raslan of PwC? 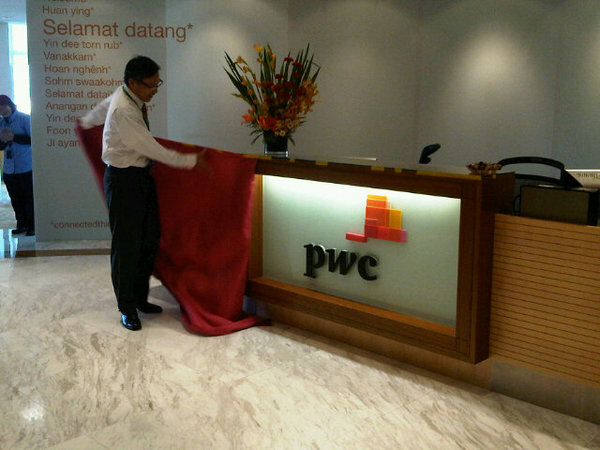 MD of PwC Malaysia, Chin Kwai Fatt, unveils the new PwC logo, and arranges seminars on Corporate Governance?!? This link here will take one to the brochure for a programme called 'Is it worth the risk? ', arranged by PwC in Malaysia to help Non-Executive Directors ensure compliance and protect asset values. In the Malaysian capital market, various stakeholders strive to ensure that a comprehensive and competitive framework is in place to encourage an ethical and transparent business environment which drives shareholder value and continuously attracts investment. Among the faculty who arranged the program are Chin Kwai Fatt, Johan Raslan and VU Kumar. Perhaps we have to ask Chin Kwai Fatt if he has ever felt the shadows from the long arms of the regulators falling over his shoulder? Session 4 is called "Chronicles of a Disaster", a case study of a dramatic failure in governance by the members of the board with the best intentions. So when PwC's Senior Partners appoint 'Sham Directors', it is done with the best intentions then? Session 5, is called "Getting it Right". All we can say is that one should not get caught, if one wants to engage in fraudulent acts or corrupt practices, because no matter how well hidden or technical these acts are, getting caught means that YOU DID NOT GET IT RIGHT!! The sheer hypocrisy of these characters deigning to educate the corporate world on the principles of good governance when they cannot even come out and defend their own actions, is an affront to all educators. "Bagai Ketam Mengajar Anak Berjalan Lurus!" One of the other faculty members is Mr Jiv Sammanthan (no longer with PwC), who has this to say on how to prevent fraud. “We must first acknowledge that fraud is, at root, a people issue. All that is needed is for one person to be motivated enough, combined with available opportunity, to commit fraud,” he told StarBiz. Another challenge is for companies to have a responsible leadership. “The senior people will need to walk the talk. Responsible leadership strives to deliver the triple-bottomline (economic, social and environmental) and achieve sustainable value creation. “It builds sustainable relationships and creates an admired brand, one that is trusted by stakeholders. “If a company has a strong culture of ethics, doing the right thing and integrity, it will attract the right people and that will pay dividends,” Jiv said. All we can say is that this is classic advice, and since Mr Jiv is not in PwC anymore, we have to channel this question to Mr VU Kumar ; as a member of the MIA Investigation Committee, have you started your investigations on the many, many allegations raised here relating to your fellow senior partners yet?